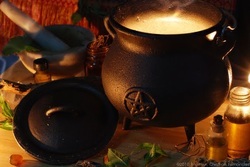 Cauldrons are an integral part of Wiccan and Pagan rituals. To many Witches, the cauldron is an indispensable item. 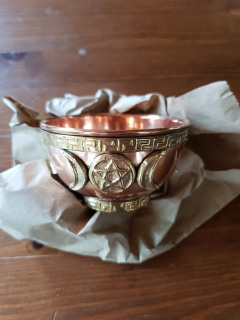 representing the womb of the Goddess, it is a pot, usually with 3 legs, to hold fire, water, incense or flowers. Your cauldron can be anything - even a pot from the kitchen, and it can be any size you wish. Your cauldron can be used on your altar, or on the space where you perform your rites, when heating is not needed.